Hariri proposed a four-point political initiative aimed at preserving coexistence in Lebanon between The Christians and Muslims. 4- Including the Baabda declaration in the preamble of the Constitution. He added: “As politicians, we have responsibilities, and both Christians and Muslims have concerns. The 2000 law was crafted against Rafic Hariri, and he was killed in 2005. In 2009 the elections were held, and we won. What happened after? 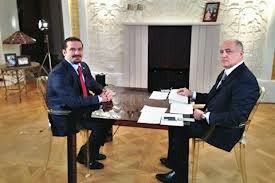 Hariri stressed that the concerns should be dealt with rationaly rather than with sectarianism. Hariri said that he accepts the electoral law proposal put forward by the March 14 MPs , based on the the 50 constituencies for electing the Parliament and the Senate will be elected on the basis of the so called Orthodox Gathering draft electoral law. Commenting on the possibility that his initiative might not be examined by the Parliament committee, Hariri said: “We want to solve a problem; the first person to oppose the Orthodox law was the President of the republic. Isn’t he a Christian? He is the First Christian. He looks for the Lebanese interest, not mine or that of March 8 or 14.We agree with him on this”. Hariri stressed : “The orthodox law divides the Lebanese, I cannot accept it for electing the parliament”. Asked why he rejects the proportional representation, Hariri said that the reason is that there will be competition in some regions, but there cannot be any competition in other regions, because of the presence of weapons in them. He is referring to the 2009 election in the areas dominated by the Hezbollah. According to the reports that surfaced back then Hezbollah gunmen prevented their rivals from voting and the results of the election showed it. On the other hand in the March 14 dominated areas several Hezbollah backed candidates won the election that was based on winner take all . In a proportional representation system Hezbollah will be able to gain more seats in the March 14 dominated areas but will not lose any seats in its dominated areas as long as it is allowed to keep its arms and use them internally for political gain . Hariri added that if March 8 had won the last elections, they wouldn’t have wanted to change the law now, noting that “the Orthodox draft law was put on the table for political outbidding. The orthodox law wants to tear the Lebanese apart, but we want to preserve coexistence”. Hariri stressed the importance of establishing a senate as agreed in the Taef accord, because it will guarantee the rights of all sects. Asked what he would do if he wins the elections, he said: “We will do the opposite of what this government is doing, on the level of electricity, communication, roads, everything. Because Lebanon today is not the Lebanon we know. This government talks a lot but did nothing. They criticize what Rafic Hariri or Fouad Siniora did. Rafic Hariri built an aiport, a sport city, Solidere. He built Lebanon and we want to pursue this path. We accomplished Paris-I and II and III ( donor conferences ). What have they accomplished?”. Asked if he will return to Beirut before the elections, he said that he will ” return for sure to Lebanon before the elections and will decide the exact moment”. Asked if he wants this February 14th to visit the his father’s grave , which now also includes the remains of former Intelligence chief Wissam el-Hassan who was assassinated last october he said: “Two roses, Wissam and Rafic el-Hariri. I hope to be there, but every day in my life is a February 14th. This date did not plant hatred in my heart but determination, because the dream of Rafic Hariri has to succeed, and it will succeed”. Regarding MP Walid Jumblatt, Hariri described him as “a friend, who will remain a friend, and who stood by us after the assassination of Rafic Hariri”. He said that the Syrian regime is involved in the assassination of Martyr Prime Minister Rafic Hariri and this will be revealed in court , expressing his belief that the same killers assassinated both Rafic Hariri and Wissam al-Hassan. “I don’t know”, but we will call them for dialogue … will be happy if the regime falls, but will not behave the way Syria’s allies behaved towards us when this regime was there. He pointed out that “Syria’s allies, during the last 8 years, preferred that regime over their partners in Lebanon”. Hariri added: “We should use this as an opportunity to unite all the Lebanese and rebuild Lebanon together “. Asked if he would meet with Hezbollah Secretary General Sayyed Hassan Nasrallah if someone mediates between them, Hariri said: “ if the purpose of such a meeting is just to talk, it is meaningless, if it can be useful then yes”. Hariri denied his group is sending fighters to Syria and stressed that what Future Movement MP Okab Sakr is doing is standing by the Syrian people and the leaders of the opposition :He added: “I am also in contact with the Syrian opposition and I have met with their leaders Moaz el-Khatib and Burhan Ghalioun”. He added that the issue of civil marriage is a controversial one in Lebanon and needs a real dialogue.